Club record signing Alireza Jahanbakhsh and striker Florin Andone both made their debuts for Brighton in a behind-closed-doors friendly at Nice's training ground today. Jahanbakhsh, who joined Albion for a reported £17m fee from AZ Alkmaar last week, and Andone both played 45 minutes as the Seagulls won 1-0 with a second half goal from Viktor Gyokeres. 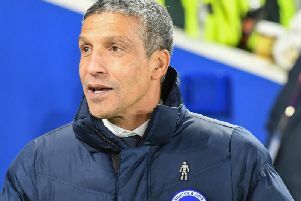 Brighton took a strong squad to France but defender Lewis Dunk was rested ahead of the Seagulls' final pre-season friendly at home to Nantes on Friday. Chances were few and far between in the first half. Solly March had an early effort saved and Andone fired just wide, while Shane Duffy blocked Allan Saint-Maximin's shot for a corner at the other end on ten minutes. Nice's Mickael Le Bihan curled a free kick wide on 33 minutes and then shot off target from close range a minute before half-time. Brighton made seven changes at half-time, with Jahanbakhsh and Andone among those to go off at the break. The Seagulls created several chances as Beram Kayal, Glenn Murray, Leon Balogun, Davy Propper and Markus Suttner all went close before Albion took the lead on 72 minutes. Gyokeres netted after Murray flicked Suttner's cross on to Propper and the 20-year-old Swede then tapped home. Anthony Knockaert and Balogun went close to a second, before sub Albion keeper David Button made a double save to ensure Brighton held on to win against their Ligue 1 opponents. Albion: Ryan (Button 45); Schelotto (Bernardo 45), Duffy (White 45), Balogun, Bong; March (Gyokeres 45; Knockaert 75), Kayal (Gross 75), Bissouma (Stephens 63), Jahanbakhsh (Suttner 45); Andone (Propper 45), Hemed (Murray 45). Subs: Bruno.